I would like to introduce a good friend of mine to you. I have known him for over 20 years. His name is Mr. Ray Ormandy. He and his wife are the creators of the PLS system. PLS stands for Pacific Language School. I hope that you will be able to meet them one day. In 2012, Henk and I took some of Ecole Hibari's children and their parents to a PLS Picnic. We had so much fun there. There was a game that we had played called "Limbo." The object of this game was for all the participants to go under "the rope" without falling down. Henk did very well. In the end, he fell down. Today's First Steps class was so much fun at Ecole Hibari in Kotesashi. There were two toddlers, a boy and a girl. This month's theme is "Animals." I am teaching various animals -- a lion, a monkey, a pig, a dog, a duck, a mouse, a cat, and an elephant. The children love it when I make sounds for each animal. For example, a lion says, "Rawr!" A monkey says, ""Ooo,Ooo,Ahh,Ahh!" A pig says,"Oink oink." A dog says, "Bow wow." A duck says, "Quack quack." These are fun sounds for children to hear and make. 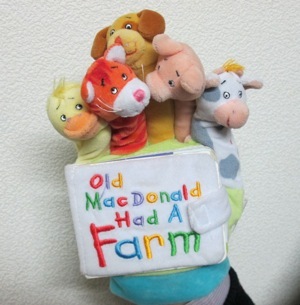 We sang "Old MacDonald Had a Farm, E-I-E-I-O" using the animal sounds that I had mentioned. If you are interested in the First Steps class, I would like to invite you to come and watch the children sing this song. "The Beauty of a Child's Smile"
I look at a child so simple and sweet. Does her personality match her cute little feet? I watch her walk in my class so slowly. Then she sings with me, I feel blessed,refreshed, and holy. The beauty of a child's smile makes me weep. But these are tears of joy -- memories I'll always keep. "What is fun for you?" Today, I would like to talk about Ecole Hibari's Junior High School Preparation Seminar. There are two seminars each month. One is for advanced-level students; the other, elementary-level students. They are offered to only Ecole Hibari students who are from the fourth to sixth grades of elementary school. I am using New Crown English Series 1, which is the same textbook being used in junior high schools in the Nishi-Tokyo area. Each student is required to bring a notebook and an English-Japanese, Japanese-English dictionary to class. Today's lesson was so much fun! There were three children, two boys and a girl. They learned what the word, "traditional", means. Here is an example of a dialog that we had practiced in class (from Lesson 3 in New Crown 1). Seira: I like sushi. What do you like? Seira: Really? I don't like it. They had to practice this dialog by making eye contact and with "big smiles" on their faces. Intonation and pronunciation were also important. The students and I had a great time today. I cannot wait for next month's seminar! If you, our Readers, would like to know more information about Ecole Hibari's Junior High School Preparation Seminar, give us a call.